With the purchase of an Air Duct Cleaning. Remove all dirt and lint clogging your dryer vent. Clothes dryers are often badly neglected by homeowners. They clean the lint filter frequently, but forget the appliance and its venting system. What most people don’t know is that as much as 50% of the lint generated by a gas clothes dryer gets past the filter and enters the vent to the outside. There, it can accumulate and build up into a thick layer. Eventually, the excessive lint causes faulty venting, which cuts down the efficiency of the dryer and can even cause a disastrous fire. Dryer Vent Cleaning – Special $59.00 with a Duct Cleaning. Regular Price $109.00 – We start by cleaning the box underneath and behind the tumble compartment of your dryer. When you clean your lint catcher and objects fall to the bottom of your dryer, this is where they go. Next, your dryer vent, which is basically the exhaust for the dryer, is cleaned from the outside vent using our air snake or our scorpion brush, then we vacuum out all dirt, debris, and lint that naturally builds up with usage. Save money on our wide range of top-quality services. Every year, over 15,000 fires are caused by lint buildups in clothes dryers. All of those fires could have been prevented with regular cleaning of the vent. Proper cleaning also prevents costly energy loss due to restricted air flow, and prevents overheating conditions. You can help protect yourself from lint buildup by cleaning your lint screen carefully after each load and by replacing the screen if it develops any holes. As the most reputable air duct cleaning company in Minneapolis St. Paul, we are happy to offer this essential service and offers special discounts when you combine it with other affordable services we offer. 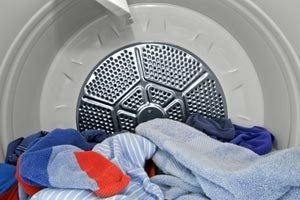 Do You Need to Clean Your Dryer Vent? Accumulation of lint around the outside vent outlet. It takes more than one cycle to dry a load. Your clothes are too hot to touch after drying. The lint screen doesn’t capture any lint. Your dryer shuts off unexpectedly. Don’t let a clogged dryer vent cause high energy costs, slow clothes drying, premature dryer failure, or a destructive fire. When you have our well-trained and highly experienced technicians clean your air ducts, add a dryer vent cleaning to your order. Protect yourself against disaster and prolong the life of your home appliance. We serve customers in the entire Twin Cities metro, from Andover, Arden Hills, New Brighton and Shoreview to Richfield, Eagan, Edina and Lakeville, and from St. Louis Park, Plymouth, Golden Valley and Hopkins to White Bear Lake, Oakdale, Woodbury and Inver Grove Heights. Contact us today to schedule this or any other of our services.